Little Khye turned 2 last Sunday. Just like tradition, I bought a cake and deco it myself, just like his 1st birthday cake. This year's theme is Mickey. Yes, I know. A super common and boring theme, but what to do...as Mickey is Khye's favourite for the moment, so Mickey-themed party it was! This year's cake is very simple. And I ordered a small cake this time because I arranged some cupcakes by Yours Truly Cupcakes (more about this later) surrounding the cake. I don't just do cupcakes because I am a cake person. I like whole cake for birthday parties. That's just me. I dug out a very vintage Mickey toy from our toy bin (this Mickey toy should be about 20 years old as it belongs to my sisters and I! ), gave it a good scrub and to be used as the cake main topper. I used mini red M&Ms for the word KHYE as I bought a very small cake. This delicious Valencia cake (Orange cream cheese mousse with chocolate genoise) is from Mon Délice Patisserie (thanks Soo Huey for the recommendation) and it is delicious. I requested them to remove all the toppings of the cake because I wanted to deco it myself. Initially I wanted to put mini Oreos on the sides of the cake, but the cake came with a pretty red ribbon and a plastic sheet, so it was quite impossible to remove it without destroying the cake. So I just left it as it was. 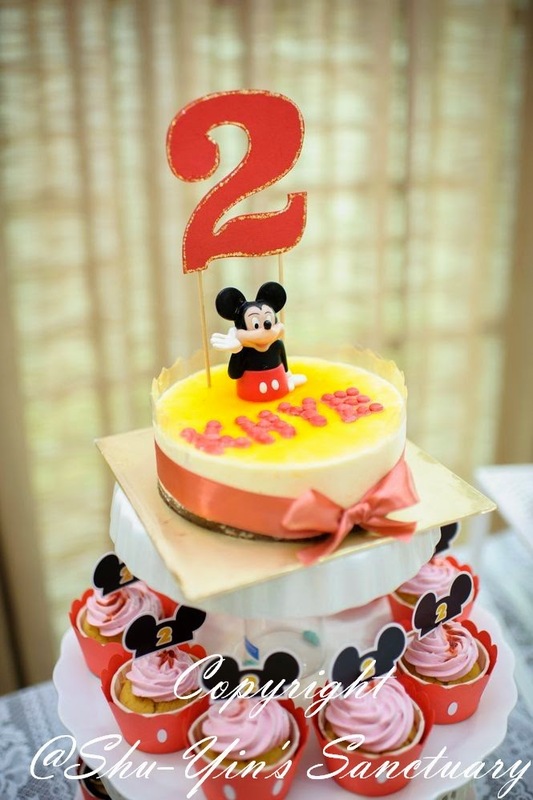 And to top it off, I requested Josie to cut out the number '2' for me as the cake topper and stuck it behind the mickey. Tada.....a simple yet elegant Mickey Birthday Cake . So there you are, an awesome one-of-a-kind 2nd MICKEY Birthday Cake for Yiu-Khye!